Berryteuthis magister: Holotype (153mm ML, 295mm TL), collected at Puget Sound, Washington, U.S.A. Photo from Berry (1912). B. magister was designated by Berry (1913) based on two large specimens from Puget Sound, Washington. Berry (1912）gave a detailed description, drawings and photos of these specimens as a different form of Gonatus fabricii in his "Cephalopods of western North America". Later he obtaind a true G. fabricii from the Irish coast in the Atlantic and considered that the Puget Sound specimens represented a new species and named it Gonatus magister. Naef (1921) placed this species in a new genus Berryteuthis based on Berry's description, characterized by having large fines (FL>1/2ML) and no hooks on the clubs. Until Pearcy and Voss (1964) described B. anonychus from off Oregon, B. magister was the sole species of the genus Berryteuthis. length to 42-43 cm ML and weight to 2.2-2.6 kg. large hooks present in medial series of arms I-III in large individuals of both sexes. Arms stout, of moderate length (<60% ML), slightly unequal, II,III>I, IV. Arm III = 62% ML. Arm IV comprising 4 rows of suckers. Arms I-III with 2 median rows of hooks and 2 marginal rows of suckers with long trabeculae. Stout and rather short, TL<ML. Tentacular clubs broadly expanded with well marked narrow dactylus and aboral keel. Club without hooks, with numerous minute suckers; suckers in median portion of manus much larger than in marginal areas. Locking apparatus, consisting of a series of small pads and suckers, along the entire dorsal margin of the club manus. Figure. Aboral and oral views of the tentacular club of B. magister, holotype, 153 mm ML. Drawings from Berry (1912). Figure. Aboral and oral views of the tentacular club of B. magister, holotype, 153 mm ML. Note locking apparatus on the upper margin in the top photograph. Photographs by R. Young (19 May '06). Head large, as broad as or a little broader than mantle opening. Funnel broadly conical, funnel organ with inverted V-shaped pad with two ovate lateral ones. Beaks. Description of the beaks can be found here: Lower beak; upper beak. See also this site. 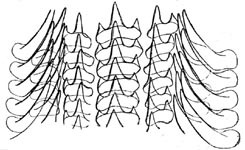 Radula with 7 longitudinal rows of teeth, central tooth tricuspidate, first lateral teeth bicuspidate, second and marginal teeth unicuspidate, horn-like. Figure. Radula of B. magister. Drawing from Sasaki (1929). Mantle cylindrical and broad (MW=30% ML). fins large rhomboidal, Fl>50% ML, FW>FL. no photophores externally and internally. B. magister has been reported widely from the west coast of Oregon, northward to Alaska Bay, Aleutian and Kurile Islands, including the Bering Sea and the Sea of Okhotsk, down southward to the Sea of Japan and northeastern Honshu, Japan. Individuals living in the northern area tend to grow larger in size and attain up to 38 cm ML. Those large individuals have a little different external morphology and bodily proportions as well as tentacular club structures from the holotype described from near the southeastern border of their distribution (see distribution map). Recently, two sub-species under B. magister have been reported from off Hokkaido (B. magister nipponensis Okutani & Kubodera, 1987) and the Sea of Japan (B. magister shevtsovi Katugin, 2000). These sub-species came from the southwestern border of the distribution of B. magister. This indicates that the speciation of this group would be advanced in the southern peripheral regions of both east and west of their distribution, including the holotype. Morphological change with growth of B. magister was reported by Kubodera and Okutani (1981). Paralavae of B. magister between 7 - 16 mm ML can be identified by having a stumpy bell-shaped mantle with small fins, large head with short, thick and stout arms and stout tentacles with 8-10 longitudinal rows of densely beset small suckers on the proximal portion of the immature clubs which are covered with minute sucker buds without a large central sucker bud. Figure. Morphological change with growth of B. magister. 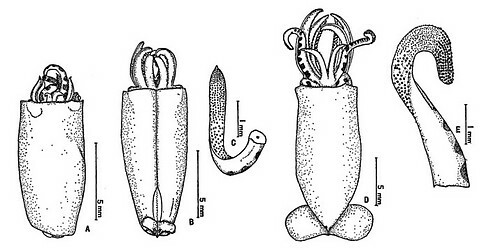 A: ventral view of a 9 mm ML specimen, B: dorsal view of a 12 mm ML specimen, C: tentacle of B, D: ventral view of a 16 mm ML specimen, E: tentacle of D. Drawings from Kubodera and Okutani (1981). Figure. 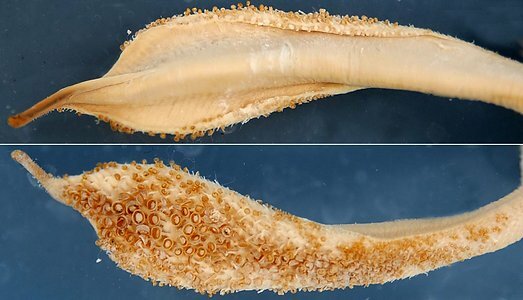 Dorsal views of the chromatophores of a B. magister paralarva, 8.5 mm ML, Gulf of Alaska. Left - Head. Right - Paralarva. Drawing from Jorgensen (2007). The distribution of B. magister is reported widely from subarctic waters in the North Pacific. It is especially abundant near the bottom off the continental shelf (deeper than 300m). B. magister is an important bottom trawl catch for Russian fisheries in the western Bering Sea and in the Sea of Okhotsk. Figure. Distribution of B. magister. Dark pink area indicates known range; light pink area indicates inferred range. Chart modified from Okutani, et al. (1988). Berry, S.S. 1912. A Review of the Cephalopods of Western North America. Bulletin of the Bureau of Fisheries, 30(1910):267-336. Berry, S.S. 1913. Notes on some West American cephalopods. Proceedings of the Accademy of Natural Sciences of Philadelphia: 72-77. Katugin, O.N. 2000. 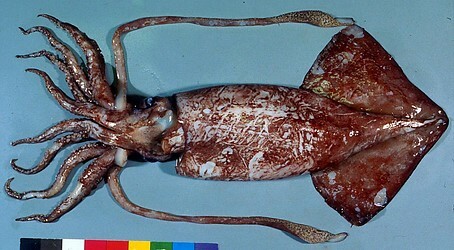 A new subspecies of the schoolmaster gonate squid, Berryteuthis magister (Cephalopoda: gonatidae), form the Japan Sea. The Veliger 43(1): 82-97. Kubodera, T. and T. Okutani, 1981. The systematics and identification of larval cephalopods from the northern North Pacific. Research Institute of North Pacific Fisheries, Special Volume, 131-159 pp. Okutani, T. and T. Kubodera, 1987. Berryteuthis magister nipponensis Okutani & Kubodera, n. sbsp. In Cephalopods from continental shelf and slope around Japan: 132-135. Japan Fisheries Resource Conservation Association, Tokyo. Page: Tree of Life Berryteuthis magister (Berry, 1913). Commander squid. Authored by Tsunemi Kubodera. The TEXT of this page is licensed under the Creative Commons Attribution-NonCommercial License - Version 3.0. Note that images and other media featured on this page are each governed by their own license, and they may or may not be available for reuse. Click on an image or a media link to access the media data window, which provides the relevant licensing information. For the general terms and conditions of ToL material reuse and redistribution, please see the Tree of Life Copyright Policies.